Monticello Automatic Greenhouse Watering System - 12 ft. The Monticello Automatic Greenhouse Watering System is designed for ALL greenhouses with rough interior dimensions of 8ft x 12ft. The Commercial grade system is similar to those used by professional growers. The Automatic Greenhouse Watering System is designed to be hung from the ceiling of the greenhouse. The 3 weighted sprinkler heads are separated by 4ft spray in a circular pattern. The Commercial digital timer is designed to allow for customer watering cycles based on climate and time of year. The Commercial grade hose is specifically designed to eliminate any bacteria or mold from the inside allowing for years of safe use. The end of the system is easily and quickly screwed onto one of the timer. The other end of the timer is screwed directly into the spigot. Automatic Greenhouse Watering System - 12 ft. The Monticello Automatic Greenhouse Watering System is designed for ALL greenhouses with rough interior dimensions of 8ft x 12ft. The Commercial grade system is similar to those used by professional growers. The Automatic Greenhouse Watering System is designed to be hung from the ceiling of the greenhouse. The 3 weighted sprinkler heads are separated by 4ft spray in a circular pattern. 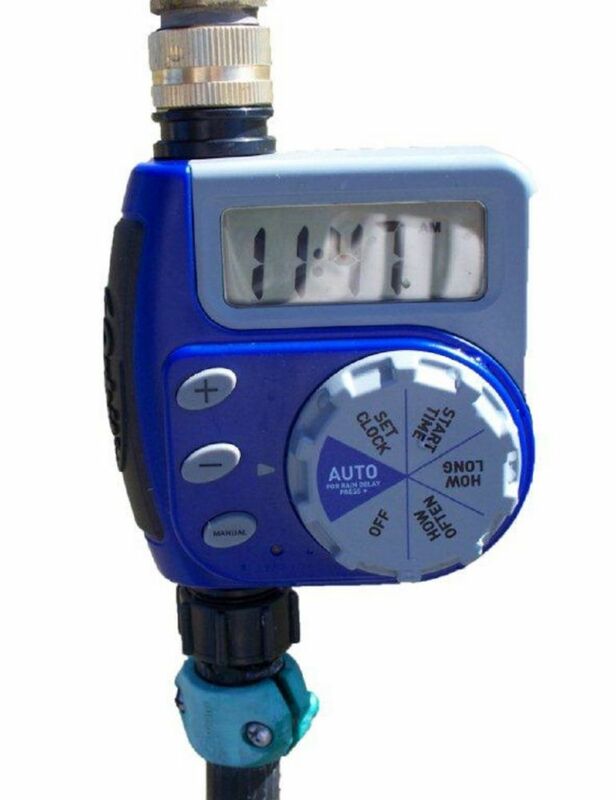 The Commercial digital timer is designed to allow for customer watering cycles based on climate and time of year. The Commercial grade hose is specifically designed to eliminate any bacteria or mold from the inside allowing for years of safe use. The end of the system is easily and quickly screwed onto one of the timer. The other end of the timer is screwed directly into the spigot.